Former Wall Street analyst (and fellow expatriate) Max Keiser predicts that American workers are unlikely to manifest the same revolutionary fervor as their comrades in Tunisia, Egypt, Syria, Yemen and Bahrain until they experience comparable difficulties paying for food. 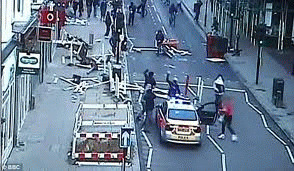 See http://www.youtube.com/watch?v=i-B2V2l_6QE (link kindly provided by a reader). Egyptians pay 40% of their income for food, Americans only 12%. Nevertheless with the impending double dip recession, continuing public service, wage and benefit cuts, and financial markets massively speculating in food derivatives (see Speculating with Our Food), Keiser believes, as I do, that this day isn't far off. As a doctor and healthy food advocate, I was well aware that the federal government massively subsidizes cheap fast food and junk food (Ending the Obesity Epidemic). America's agricultural subsidies kill literally millions of Americans every year, by creating an epidemic of obesity and related medical conditions, such as diabetes, high blood pressure, heart disease and stroke. Yet until Keiser raised the issue, I never recognized the importance of these subsidies in suppressing popular unrest. It seems the main purpose of US agricultural subsidies isn't to help farmers or even the massive food conglomerates that run factory farms. They are intended is to control the single most important factor driving third world resistance movements -- namely the cost of food. I was also interested in Keiser's view that no subsidy program has the ability to control rising food costs, so long Obama refuses to regulate the investment banks that are driving up food prices by speculating in the food commodities market. World Bank President Robert Zoellick describes the link between the cost of food and regime change in an oped he wrote for the Financial Times in February 2011 (only paid subscribers can read the FT article, but it's summarized at click here). The oped points to the widespread food riots that occurred in 2008 due to a sudden spike in food prices -- as well as triggering regime change in Haiti. However according to Zoellick, the 2011 food crisis is even worse -- with rising food costs forcing 44 million people into poverty between June 2010 and January 2011. The February 27 Independent http://www.independent.co.uk/news/world/africa/the-price-of-food-is-at-the-heart-of-this-wave-of-revolutions-2226896.html and March 2 Energy Bulletin http://www.energybulletin.net/stories/2011-03-02/energy-food-revolution-inextricable-link offer a somewhat less ideological analysis than the World Bank president. The Energy Bulletin links the collapse of the Soviet Union to skyrocketing food prices. They point to a sudden decline in oil prices (with oil exports being the Soviet's primary source of foreign revenue) in the late 1980s, leaving the Soviets unable to buy adequate wheat on world markets. Most commentators seem to agree that the magic number is 40% -- that civil unrest becomes inevitable once food prices consume more than 40% of workers' incomes. I think the figure that ultimately triggers food riots in the US might be lower. During the Great Depression, Americans were forced to spend 35% of their income on food (http://www.enotes.com/1930-lifestyles-social-trends-american-decades/making-do-family-life-depression). Although we don't read about them in mainstream history books, there were extremely bloody battles in Washington over Hoover's refusal to pay the bonus that had been promised World War I veterans. Barbara Kingsolver writes about some of them in her 2009 historical novel The Lacuna. Otherwise I totally agree with Keiser's and Zoellick's food theory of revolution, especially in countries like the US where psychological oppression is a bigger problem than political oppression. Psychological oppression is much less prevalent in countries like Greece, France and Spain (and apparently Britain), where strong working class consciousness enables workers to instantly identify when the government and corporate elite are screwing them. In these countries, workers are far more willing to take to the streets over less life threatening issues -- for example, hikes in student tuition, high youth unemployment, pension cuts, an increase in the retirement age, unpopular wars and evidence of corruption in the criminal justice system. One erroneous conclusion some Americans draw from Keiser's and Zoellick's "food theory" of revolution is that organizing is unnecessary -- that all we have to do is wait until the food bill reaches 35-40% of workers' income and leaves them no money for rent, clothes, medical care and other necessities. The first problem with this "no nothing" perspective is that it overlooks years of sustained organizing by Egyptian unions and social justice groups that laid the groundwork for organized rebellion in February 2011 (see Egypt's Invisible Labor Movement). The second problem with opting for inaction is that we greatly increase the probability the capitalistic political-economic system will collapse into utter chaos. If we simply wait for global capitalism to self-destruct, we will most likely end up with a violent, fragmented failed state -- like Afghanistan, Somalia or post-Soviet Russia -- controlled by criminal gangs and sociopathic warlords.